The Greater Hollywood Chamber of Commerce R.E.A.C.H. Committee and CIRC Hotel invite you to celebrate a Saturday evening, and to support Disability Programs & Training on a mission of significant value to the community. 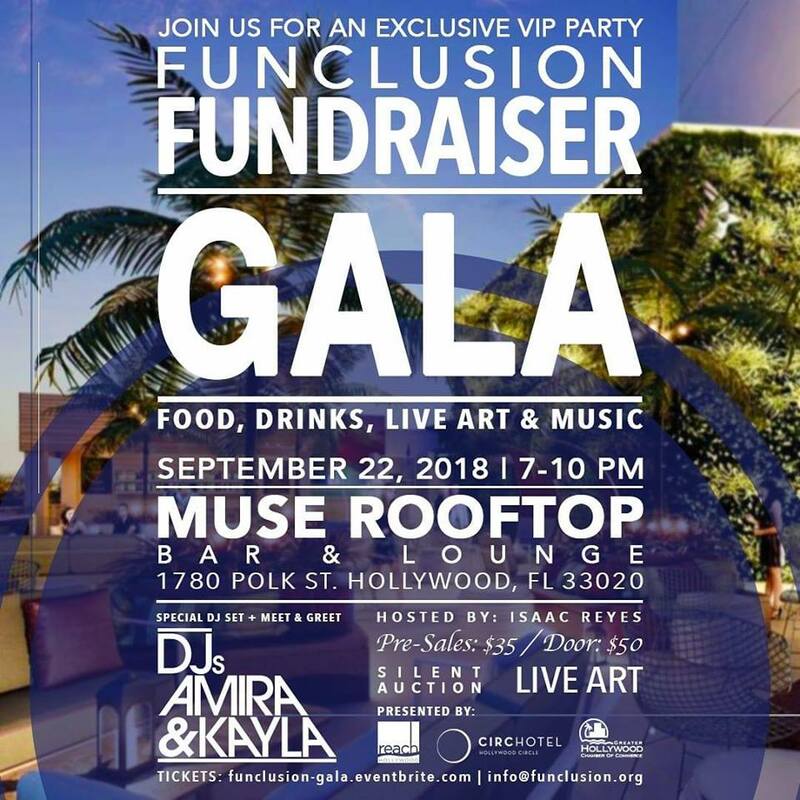 Network with local business owners from Hollywood and beyond, overlooking the ocean from Downtown Hollywood CIRC Hotel's magnificent Muse Bar Rooftop Lounge - as we come together in support of Funclusion 2018 (www.funclusion.org), a FREE Family Event happening the next day Sunday at the German American Club of Hollywood, promoting inclusion through entertainment and the elimination of social stigmas surrounding disabilities. Enjoy an intimate mini-set by international DJs Kayla & Amira, seen on the Stever Harvey and Jimmy Fallon Shows. Established cymatics visual artist Anya Nadal will be completing a piece LIVE to be offered for silent auction. Live performances by Fabian Carrera and Jalen Depew. Hosted by Miami based TV and film actor Isaac Reyes. Tickets include bites, refreshments and photo opportunity. Ticket sales proceeds go towards the 501c3 tax exempt nonprofit efforts of Disability Programs & Training (DPT), including the flagship event Funclusion 2018 to be held on 9/23/18 at the German American Club of Hollywood, Florida. Find out more - and ways you can get involved - at www.funclusion.org.